We are a boutique law firm providing strategic lawyering services to cultivate our clients’ innovation. Click here for a short summary of what we do. • Watch our client Gene Dolgoff’s talk on The Importance of Patents. 50% Discount on New Trademark Searches in April 2019! Through April 30, 2019, we’re offering a 50% discount off of the price of all trademark searches! As long as 1) the specifics of the project are agreed upon by April 30, 2019; and 2) the funds for the search are deposited in our client trust account by April 30, 2019, then you’ll receive a 50% discount. Call us at (610) 892-9942 or e-mail us. As a member of the Data Protection Advisory Council, we invite you to a free webinar by our friends at Red Lion compliance and risk management services. At 3 PM EDT, Joshua Marpet will speak on: CCPA, less than a year out. Are you scared? followed by a campfire-style, ask-me-anything discussion among DPAC members and the audience. Gerry Elman and Josh Waterston participated in the Cloud Security Alliance (Delaware Valley Chapter) meeting. They appreciated emphasis by each of the speakers that it is essential to get legal advice on the form agreements from the various providers when developing a multi-cloud strategy for the enterprise. On March 7th, 2019, Josh Waterston spoke at a luncheon of local intellectual property lawyers about two recent Supreme Court decisions affecting copyright. One of them requires a copyright owner to wait to file an infringement suit until he receives the registration certificate from the Copyright Office. This may take as much as seven months from filing, unless the owner pays extra for expedited processing. Use the Contact Us form if you’d like more information on these recent developments. On February 7th, 2019, Gerry Elman spoke at a luncheon of local patent lawyers on the Patent Eligibility Guidance issued by the USPTO on January 7th and the Supreme Court decision interpreting the on-sale bar, issued January 22nd. Use the Contact Us form if you’d like more information on these recent developments. Companies generally have records of their intellectual property (“IP”) in the categories of patent, trademark, and copyright. But most overlook the value of their data that would qualify for protection as trade secrets. Because trade secrets don’t get registered with a government agency, they’re the red-headed stepchild in the IP family. Yet when your company assesses and documents its trade secrets, you enhance their protection against misappropriation. Gerry Elman and Josh Waterston of Elman Technology Law, P.C., shared a roadmap for making this a part of your comprehensive data protection strategy. 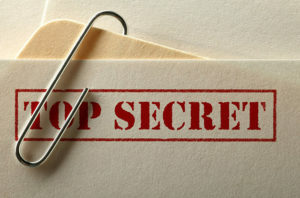 Companies can learn how to get the benefit of trade secret protection not only under longstanding local state law, but also under a comparatively new federal statute – the Defend Trade Secrets Act of 2016. Click here for the download page of their presentation. Gerry Elman and Josh Waterston attended the the National CIO Government Technology Conference at the Pyramid Club in Philadelphia. Gerry Elman and Austin Morris of Morris Risk Management co-presented the lunch keynote on “Cyber Security and Cyber Risk Management”. Click here for the download page of Gerry Elman’s slideshow on “Mitigating Legal Risk From Cyber and Privacy Infractions”. Josh Waterston and Gerry Elman participated in a panel discussion on cybersecurity, co-sponsored by the Technology Professionals Networking Group (TPNG) and the Philadelphia Area Great Careers Group (PAGCG) at WeWork, 1900 Market Street, Philadelphia. 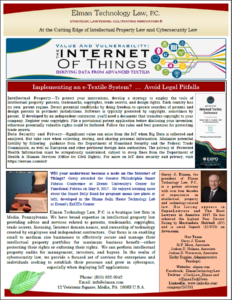 Gerry Elman gave a guest lecture on “Patents and the Internet of Things (IoT)” at Temple University Law School. If you’re developing a Smart Technology, helping a company navigate the Internet of Things, or just curious about the subject, click here for the page to download his presentation. Gerry Elman was a presenter at IFAI Expo, the gala trade show of the Industrial Fabrics Association International in New Orleans. 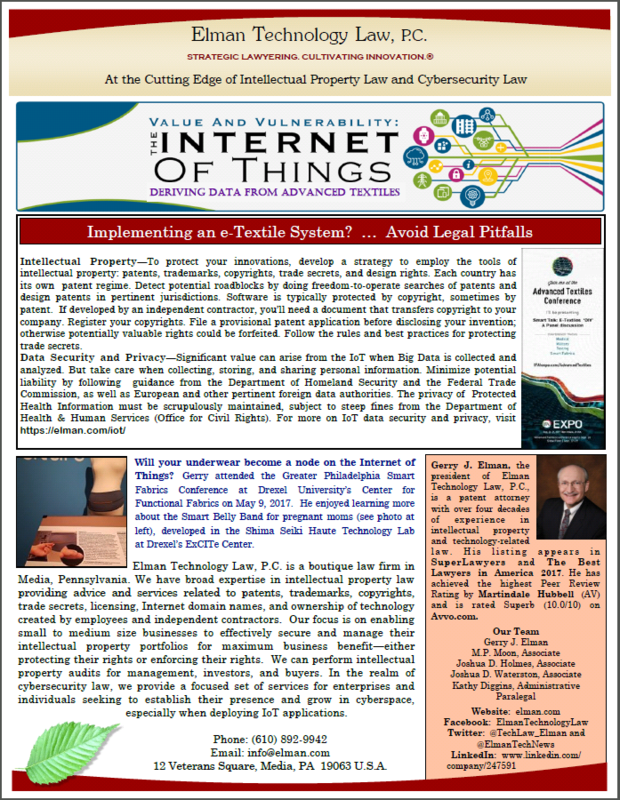 Gerry spoke at three sessions, on intellectual property and cybersecurity issues regarding Smart Fabrics. Read this article from Advanced Textiles Source that quotes him. The Risk is Real. Is Your Business CyberSecure? 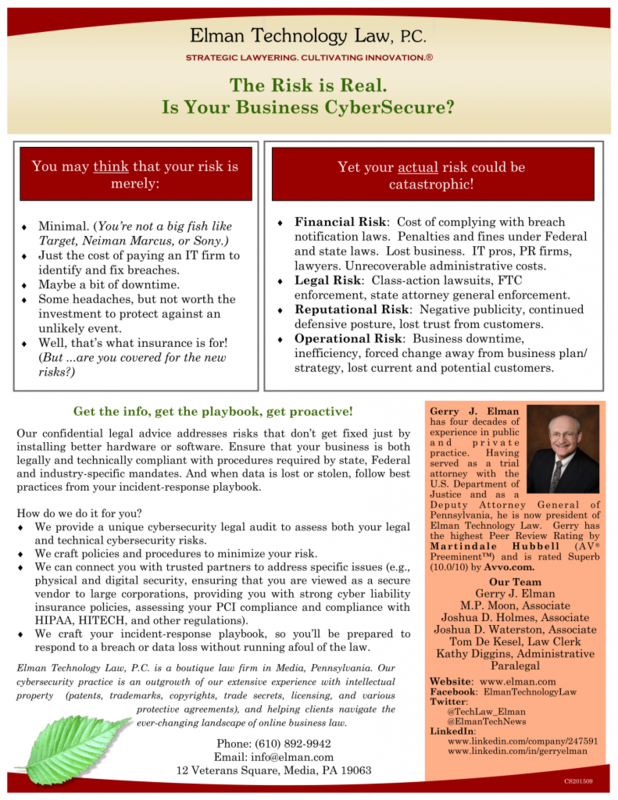 Is Your Business CyberSecure? Click above for full-size image. Many of our clients have been asking whether they should be seriously concerned about cybersecurity, or if maybe it’s just a bunch of media hype. Unfortunately, this is one area where what you don’t know can hurt you. Companies large and small continue to be victims of cyber-incursions. C-Suite executives of these companies are being held responsible for the safety and protection of their information assets. A security breach of a small company is all too often leveraged as the soft spot from which to drill into its customers’ information systems as well. For example, Target was breached through its HVAC vendor. Increasingly, large companies are declining to do business with vendors that can’t show they have a mature cybersecurity program. We can help. Contact us today to schedule a cybersecurity legal audit. For a modest investment of time and money, you’ll learn your legal and technical risks, and we’ll provide tools to reduce and maybe even eliminate many of those risks. Call 610-892-9942 or send a message by the Contact Us form on this page. Technological progress is sparked by vision — such as the creative imagination shown by legendary authors of science fiction. But innovation doesn’t find its way into the real world unless fueled by a variety of resources. With the tools of legal protection, visionaries gain the leverage to deploy such resources. At Elman Technology Law, P.C., we endeavor to energize the fulcrum point at which science fiction meets legal vision. Elman Technology Law, P.C. provides trusted advice and representation in intellectual property and Internet-related business matters. With extensive experience in patent, trademark and other aspects of the law related to technology and business, we offer the educated guidance that enhances our clients’ likelihood of developing their innovations from concept stage through profitable realization in the marketplace. As a pioneer in cyberlaw, we aid clients conducting all sorts of business via the Internet. Our clients include developers and providers of computer and information technology, including content and applications for the Internet, companies involved in electronic commerce and in bioinformatics, companies developing new products in the biotechnology and chemical industries, and other domestic and foreign businesses and individuals that we assist in intellectual property protection, contract negotiation and dispute resolution. Often we collaborate with a client’s general counsel, whether in-house or in a law firm, to add to the team our unique expertise and experienced judgment. In other instances we work with patent counsel of a foreign company to provide representation before the U.S. Patent and Trademark Office. We think of strategic lawyering as a collaboration with clients in which we strive to use the tools of the law strategically to fulfill their overall goals, more than just reactively or episodically. Cultivating innovation reminds us of the organic nature of change and that our function is to help nurture invention and its implementation in the real world. As the legal environment for innovation is transformed, we remain vigilant and continually seek to help clients develop an overall strategy for deploying intellectual property to maximize long-term business value. A fundamental value at Elman Technology Law, P.C. is the importance of frequent and direct communication between the client and our firm. Our attorneys play an integral role in the development of our clients’ projects, providing ongoing legal support and counsel. To facilitate the timely preparation of documents and correspondence, we were one of the first law firms to use computers and to communicate with clients by electronic mail. To enhance communication worldwide regardless of distance, we are available for videoconferencing via Skype (ID: gerry.elman) and via Zoom or Amazon Chime. Our firm is proudly listed in the Martindale-Hubbell Bar Register of Preeminent Lawyers. We were a charter member of the Eastern Technology Council, which in 2010 merged into PACT, the Greater Philadelphia Alliance for Capital and Technologies. Among his many activities, Gerry Elman participated for six years in a Vistage Trusted Advisors roundtable and has served on the Board of Governors of the Philadelphia Intellectual Property Law Association. We subscribe to the law firm policy statement of the International Institute for Conflict Prevention and Resolution (CPR). This means that we have pledged that our lawyers are knowledgeable about alternative dispute resolution procedures and will discuss them with clients. The aim is to provide an informed choice concerning the most cost-effective techniques for resolution of a dispute.